Julie Niehoff will leave you with simple, manageable steps you can take right now to get more out of your own marketing without having to change the way you do everything and without having to spend a lot of money. This session will include time for Q&A with a focused discussion on whatever topics our participants bring into the mix. 2 for 2 Member Showcase features Blain Haig from Gold Standard Floor Care. Free for AIBA members and prospective members. Thank you to Texas Coffee Traders for fabulous coffee and Tacodeli for delicious breakfast tacos to start our day off right! Niehoff has more than 20 years in technology marketing and her background is largely focused on education and training. One of her most recent projects was to build the new AIBA website, IBuyAustin.com. Her speaking style is informal, non-technical and practical. 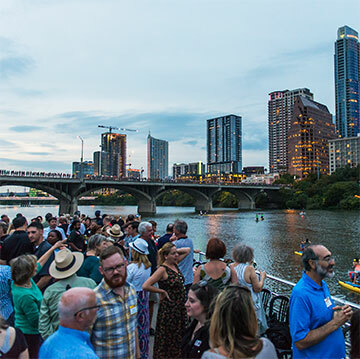 Come have a fabulous time on one of Austin’s most beautiful treasures with a cruise on the lake. Capital Cruises takes us on their double decker for a cruise with food, friends, music and drink. And it’s all free! This cruise is dedicated to growing two great organizations—AIBA and SOS Alliance. So bring your friends and colleagues to support these important organizations through joining us. Free for members and prospective members of AIBA or SOS Alliance. We’ll have great pizza from Conans Pizza, a Special Dillo Drink with Tito’s Vodka as well as other selections to wet your whistle. The boat opens at 5:30 and we leave the dock at 6 sharp. Parking is available in the Hyatt parking garage for $6.00 for the first four hours and $13 for 4-7 hours. Valet parking is available at the Hyatt for $15.00. Some street parking is available. The success stories of Austin businesses inspire us to greater and more enjoyable success ourselves. This year, we’re highlighting newer and younger businesses at our AIBA breakfast meetings. What energy they add to our town! 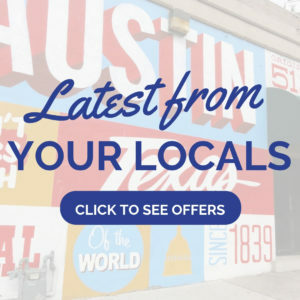 Antonelli’s Cheese Shop is a perfect example of younger people starting a business that really adds to Austin culture. Kendall Antonelli writes, “Two years after John Antonelli announced on our honeymoon that he wanted to quit his job and “do something in cheese,” we unlocked the front door to our very own cheese shop on February 11, 2010. We’ve been asked many times since, “Why a Cheese Shop?” and the answer is simple. After putting ourselves through cheese bootcamps, running a cheese club out of our house, attending cheese conferences, interning for French affineur Herve Mons, journeying through Europe, and eating our way through thousands of tasty cheese morsels, we honed in on our true passions. Then, over a bottle of wine one evening, we realized that working together behind a cheese case would allow us to fulfill them all: eat great cheese, share the stories of artisanal producers, and spread joy through good bites. Ignoring all evidence of a down economy we went for it, determined to be led by our mission: Do Good. Eat Good. Today, we have our flagship brick-and-mortar cheese shop in Hyde Park, a cheese house where we host 200+ public classes and private events yearly, a wholesale program sourcing for over 150 Central Texas chefs, and an e-commerce site selling and shipping nationwide our monthly cheese club, gifts, and cheese trays. Come enjoy cheeses and a stimulating talk and discussion with John and Kendall Antonelli! Free for AIBA members and prospective members. Thank you to Texas Coffee Traders for fabulous coffee and Tacodeli for delicious breakfast tacos to start our day off right! 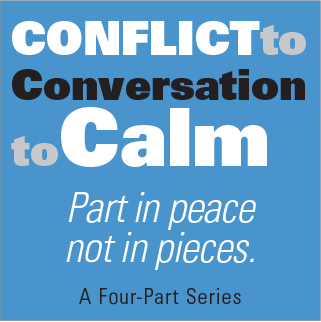 This is the fourth event in a four-part series: Conflict to Conversation to Calm: How to Part in Peace, Not Pieces. Managing Conflict Step by Step is a panel discussion. Kris Donley, Dispute resolution Center, provides successful language you can use. David Lauterstein, Lauterstein Conway Massage School, leads us in healing after conflict. We’ll enjoy a delicious Speciality Taco Dinner Buffet. If your dietary needs do not include tacos, please contact Dixie Patrick. AIBA events are open to members and prospective members. Get a FREE Lunch! If you aren’t yet an AIBA member, become a member of AIBA at this event and lunch is on us! If you are an AIBA member, bring a colleague who isn’t yet a member. When they join AIBA at the event, we’ll cover both your lunch and theirs!